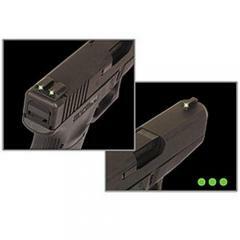 Experience ultimate sight visibility with the Brite Site Tritium Sights from TruGlo. The engineers at TruGlo have harnessed the lasting natural glow of tritium to produce a vibrant sight pattern that transitions seamlessly from light to dark environments. No battery or external power needed; tritium is a self-illuminating mineral, ideal for creating a lightweight and constantly-visible sight. Green front and rear optics align easily for rapid target acquisition. Designed to support tactical operatives, these sights are enclosed in an opaque casing to prevent enemy detection. A smooth, snag-resistant design prevents catches when drawing and allows for effortless holstering. The CNC-machined steel construction ensures lasting durability and performance.